#1 bestselling author Brian Freeman returns to the sun-drenched beaches of Naples, Florida, and the idiosyncratic world of Detective Cab Bolton in this "brilliant" and "chilling" story of political intrigue and murderous revenge that will keep you guessing until the very end. Attractive and popular politician Diane Fairmont is running for the Florida governorship, but a chill is cast over the campaign when she receives an anonymous note announcing the return of the assassin who killed her husband ten years earlier. As Bolton struggles to penetrate the veil of secrecy surrounding the Fairmont campaign, he begins to realize that the death threat is not the only danger faced by the campaign staff. A desperate race against the clock ensues as Bolton tries to unlock the secrets of a poisonous conspiracy before nature provides the perfect cover for a long-dormant killer to strike again. 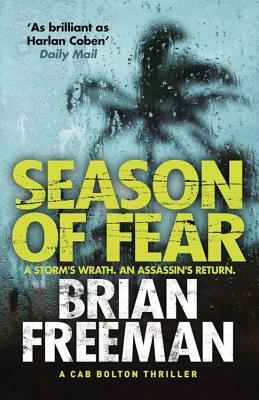 A native of Chicago and longtime resident of the Twin Cities, Brian Freeman is an international bestselling author of psychological suspense novels. His books have been sold in 46 countries and 20 languages and have appeared as Main Selections in the Literary Guild and the Book of the Month Club. He is the author of The Cold Nowhere, a finalist for the 2014 Minnesota Book Award, and Spilled Blood, which won the 2013 International Thriller Writers' Thriller Award for Best Hardcover Novel. The Burying Place was a finalist for the 2011 Thriller Award. Also in 2011, The Bone House was a finalist for Best Audiobook of the Year in Thriller/Suspense as well as the Minnesota Book Award. Brian's debut thriller, Immoral, won the Macavity Award and was a nominee for the Edgar, Dagger, Anthony, and Barry awards for best first novel. "Season of Fear has everything: unexpected plot twists that keep on coming, a smart and charming hero, and a setting that's as sultry and dangerous as a tropical storm. It will blow you away." "A hurricane-force thriller . . . More twists and turns than a tornado."